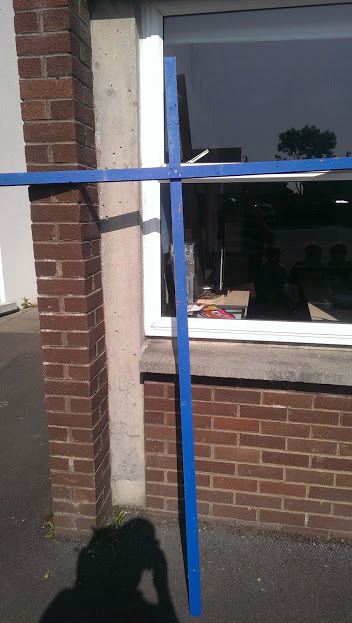 The first thing we did was cut the wood to the right size. 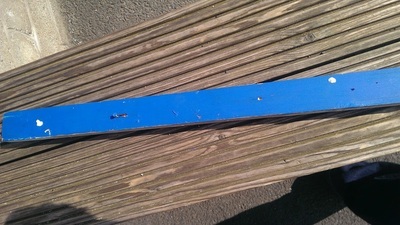 Then we nailed the wood together. 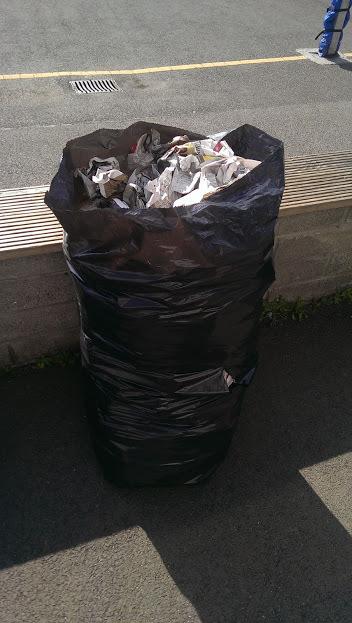 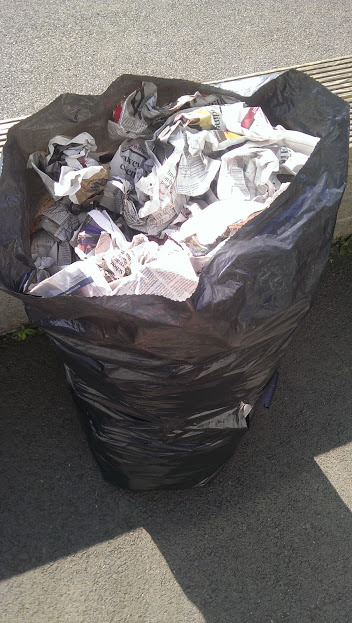 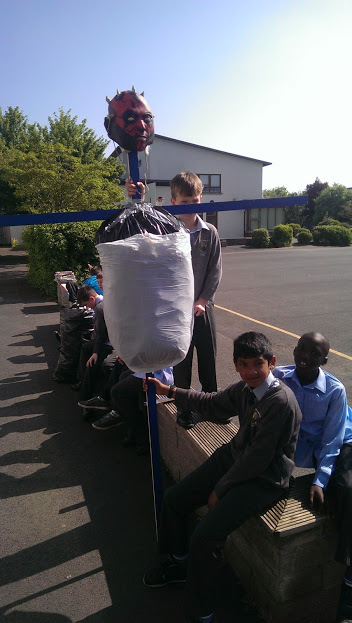 Next we filled the bags with newspapers for the body an legs . 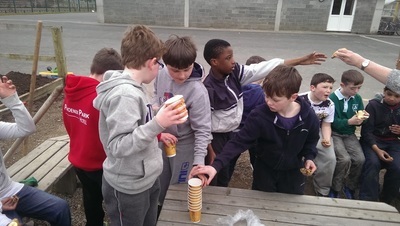 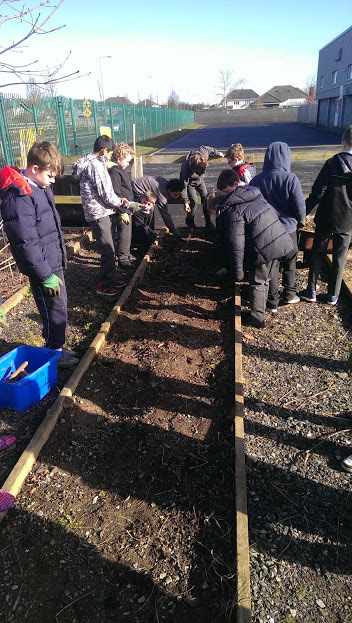 Then we attached it to the wooden planks. 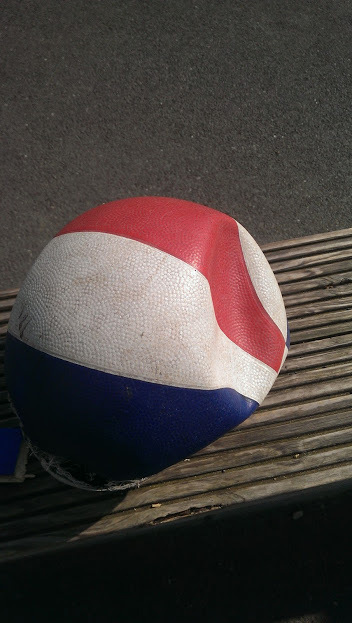 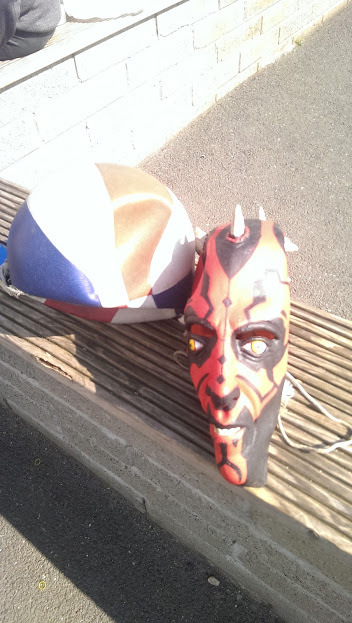 After that we used the burst basketball and mask for the head and attached it to the planks. 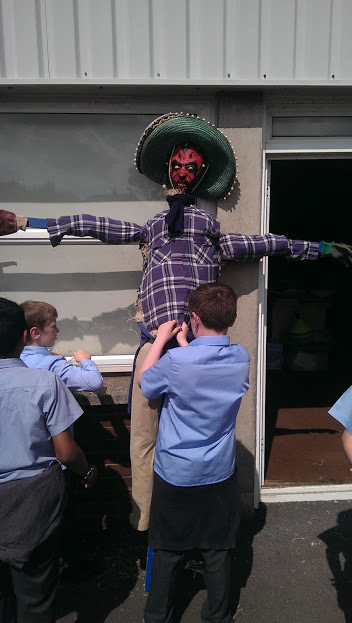 It looked scary now! 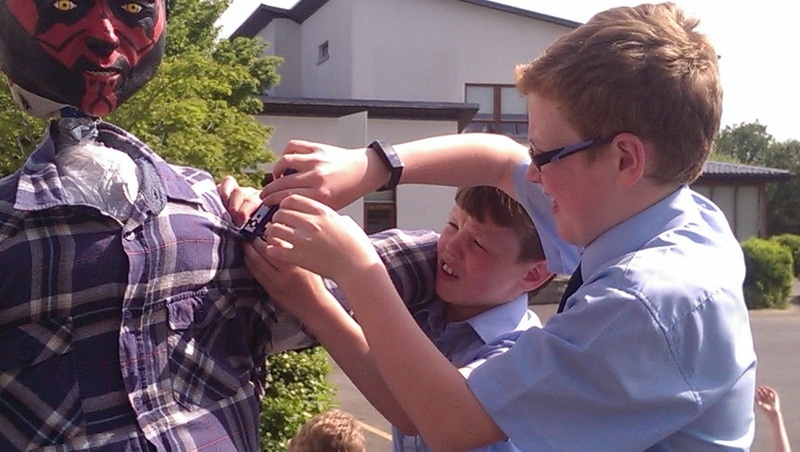 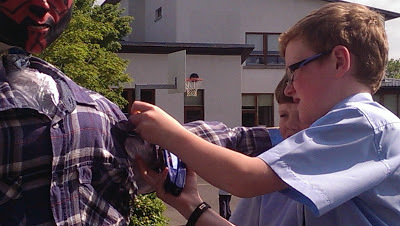 After that we put the gloves on along with the shirt and trousers. 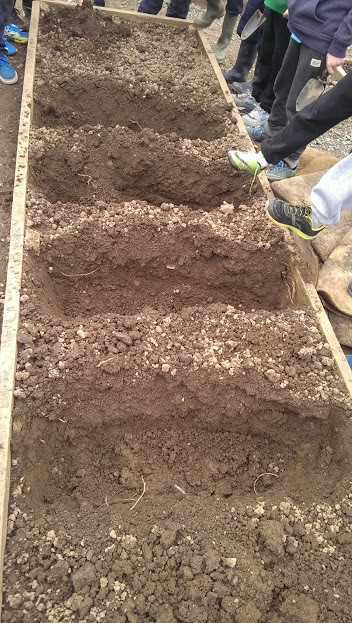 And we put straw in the gaps. 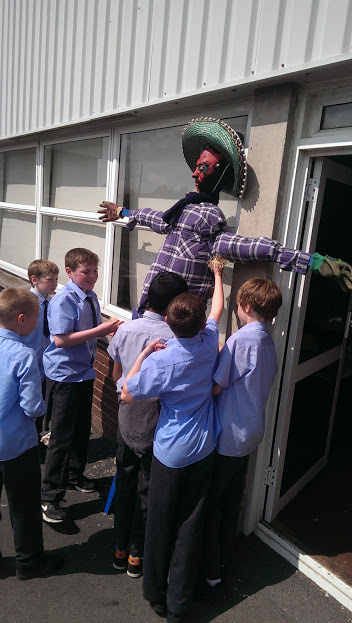 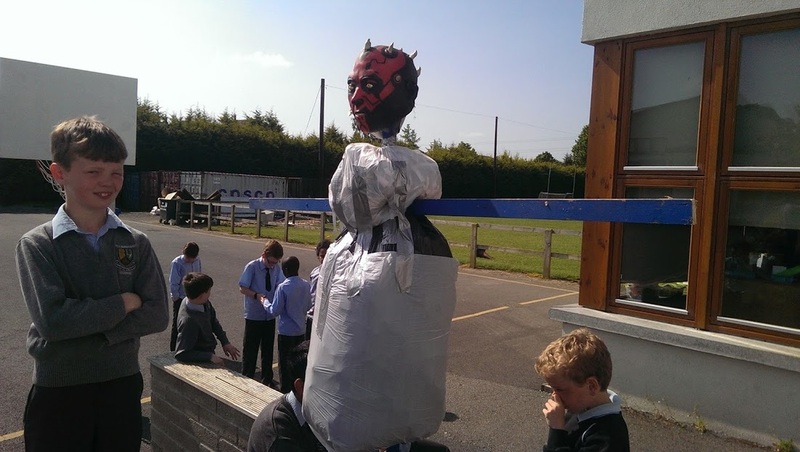 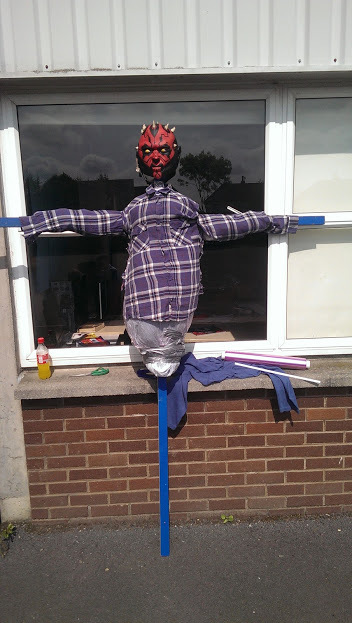 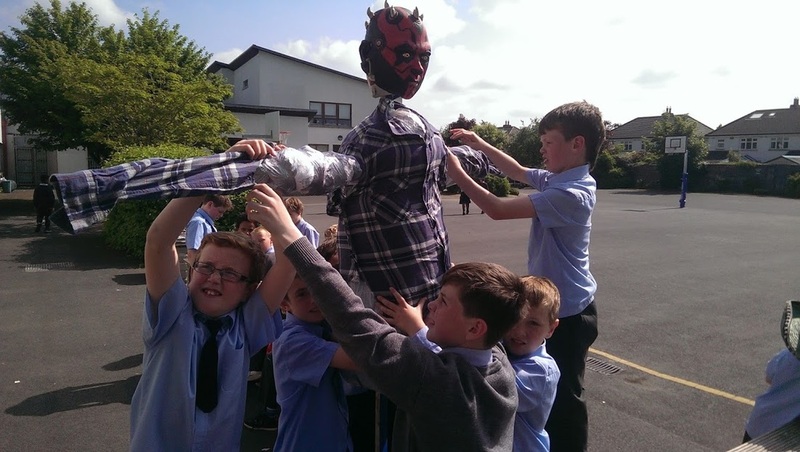 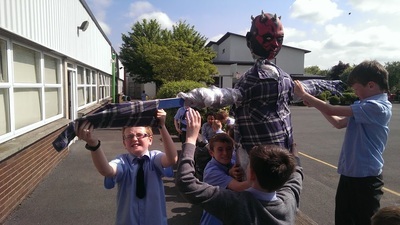 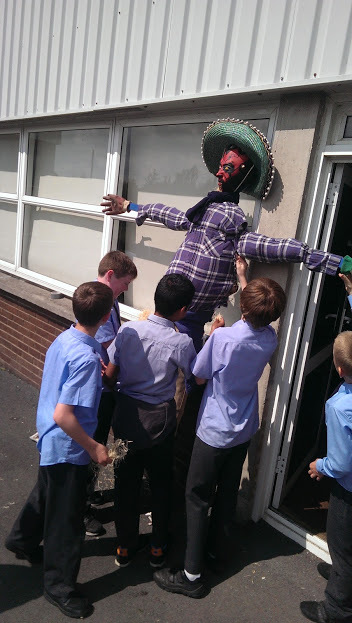 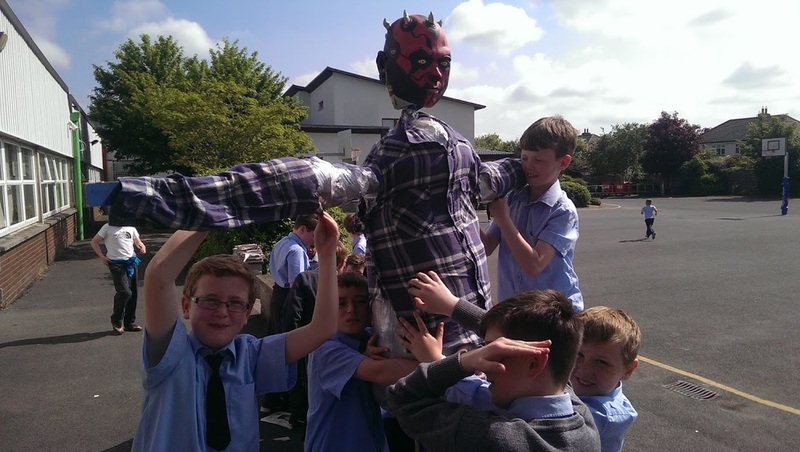 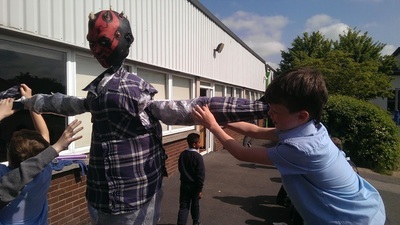 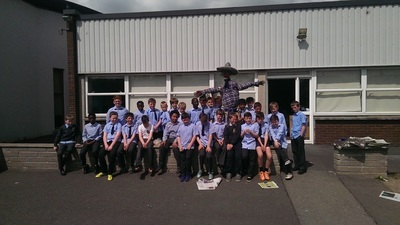 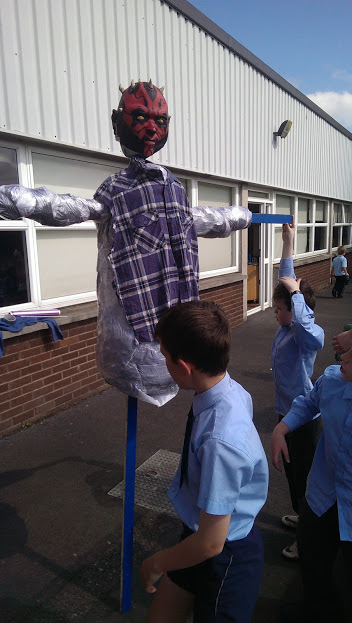 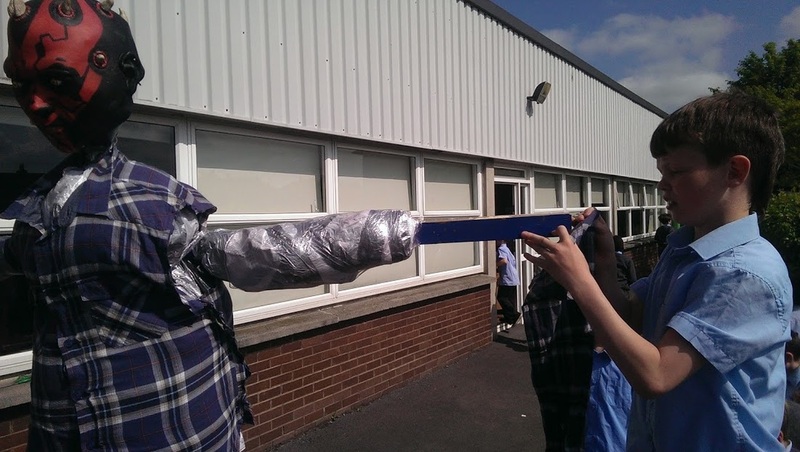 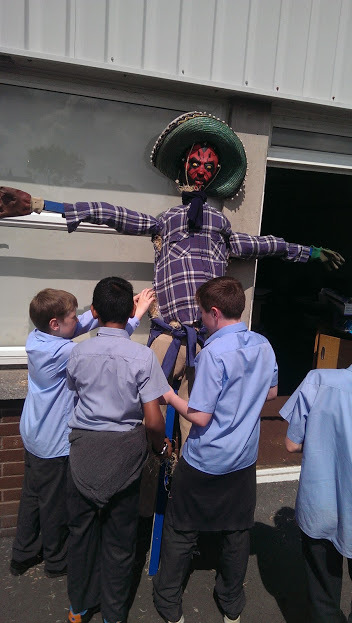 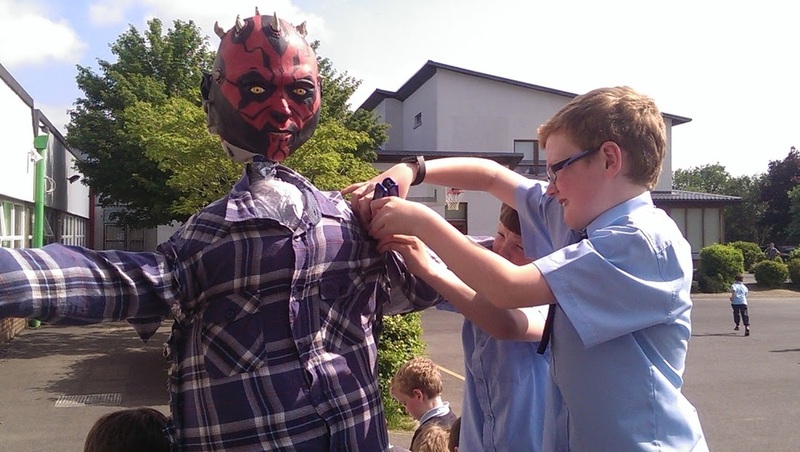 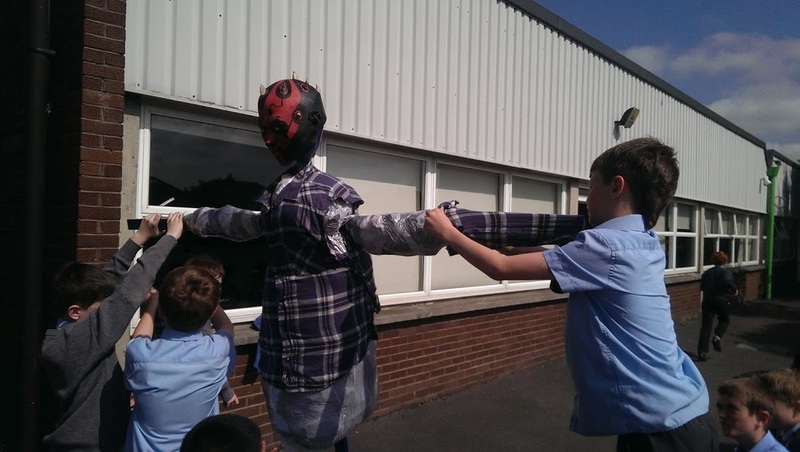 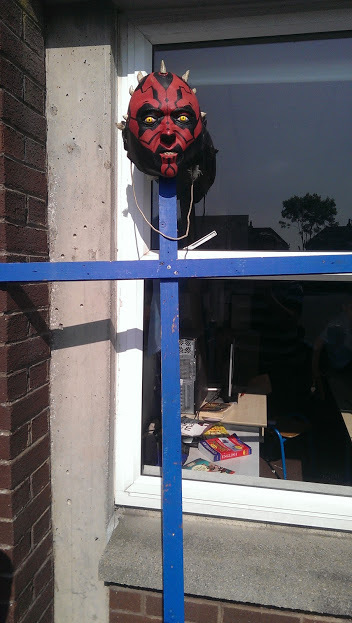 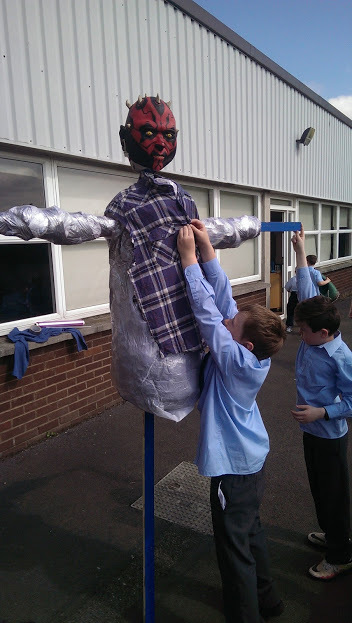 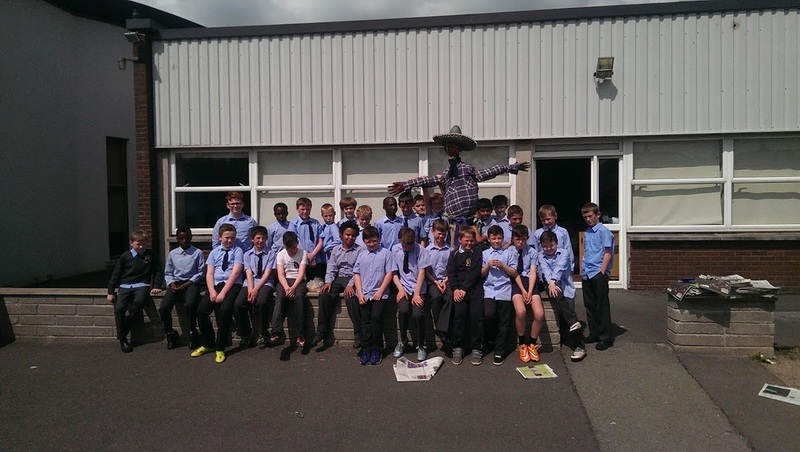 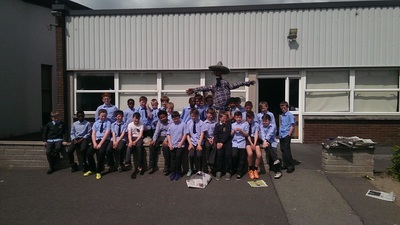 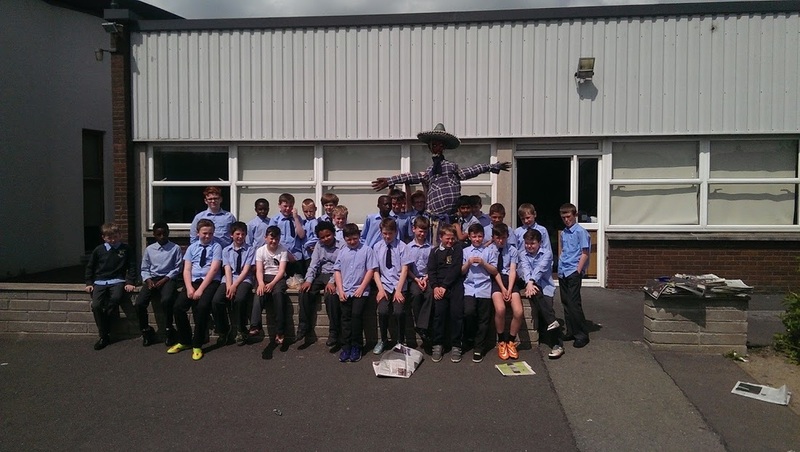 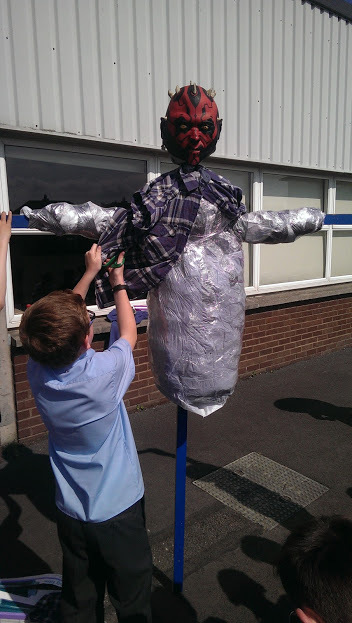 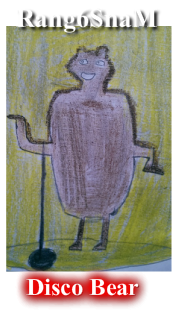 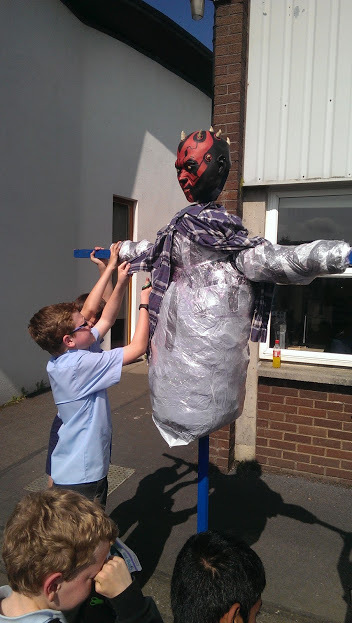 There are pictures of us making the scarecrow and of it when it was finished. 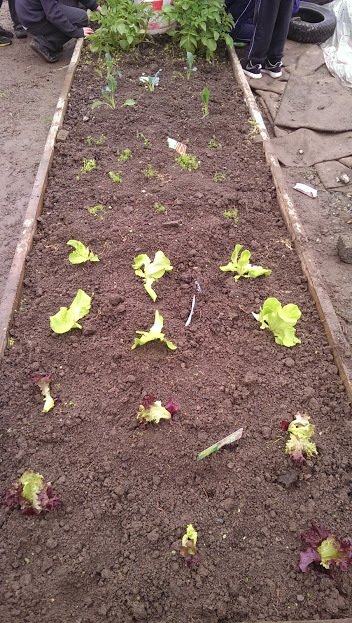 2 weeks ago we planted carrots and lettuce and cabbage. 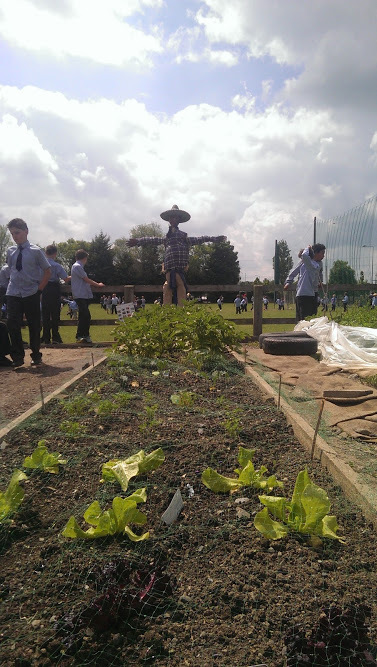 We got a net and covered the carrots and lettuce. 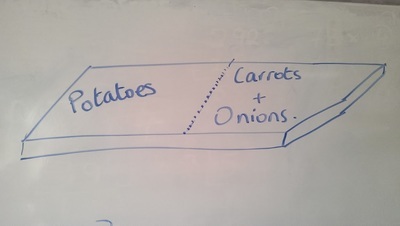 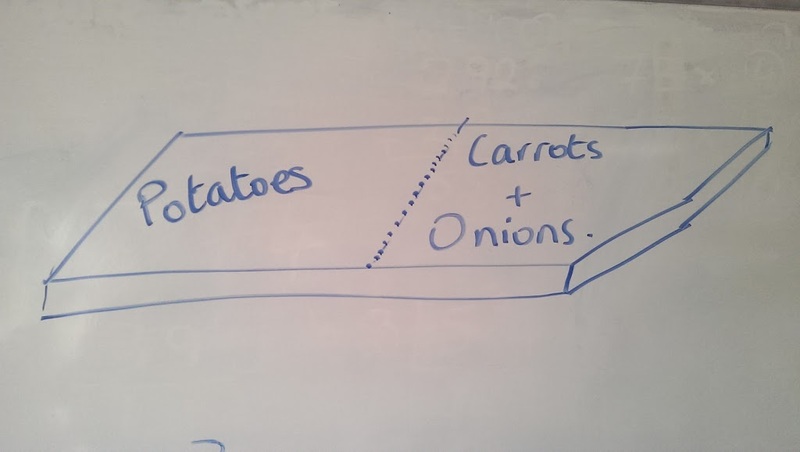 To prevent carrot flies and birds from eating the vegetables. 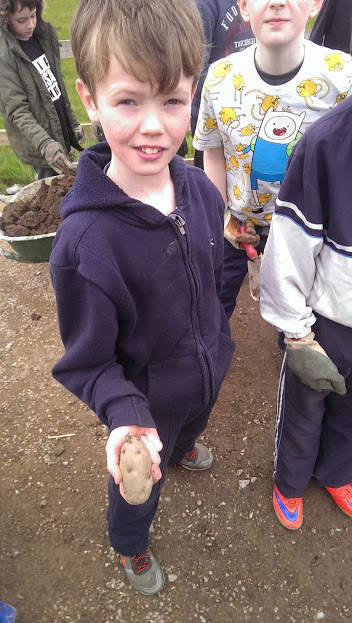 They are looking delicious. 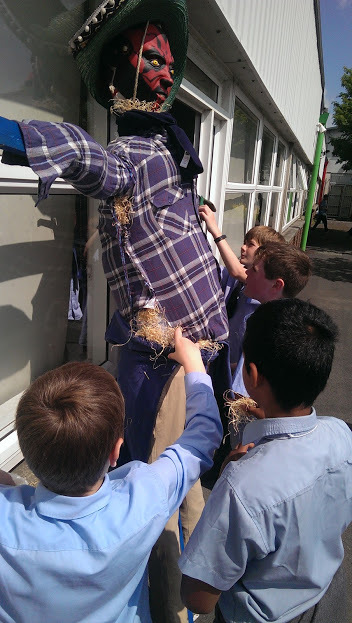 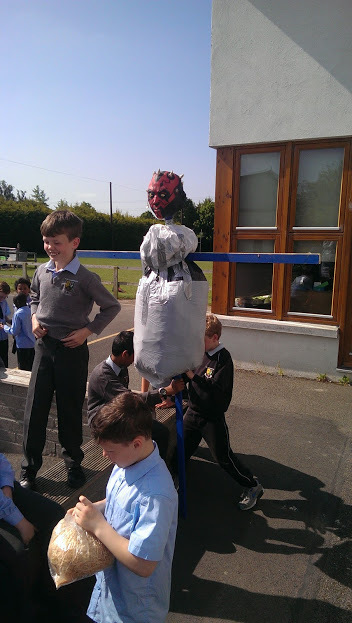 We made a scarecrow to scare the the birds. 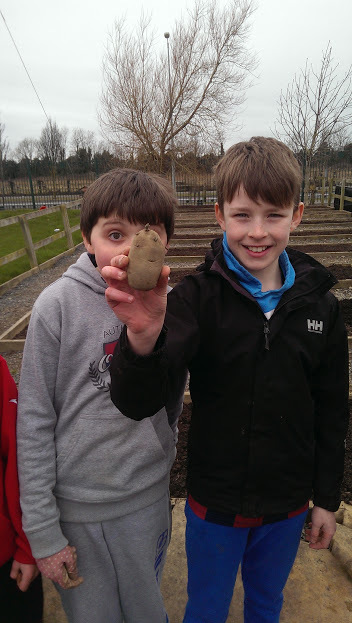 We cant wait until we eat them!! 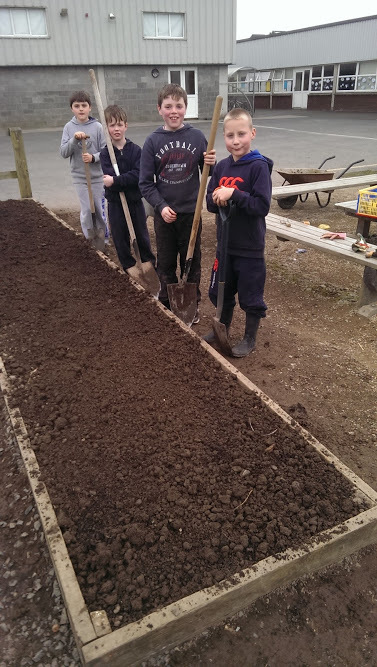 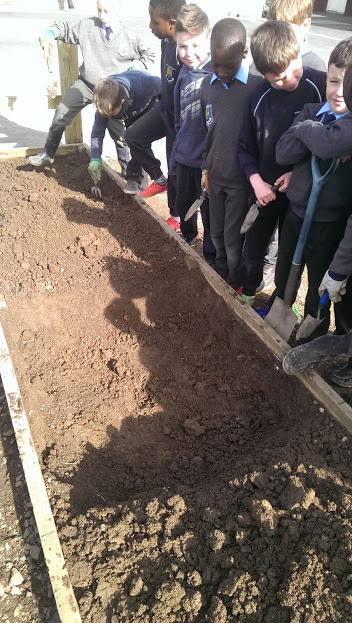 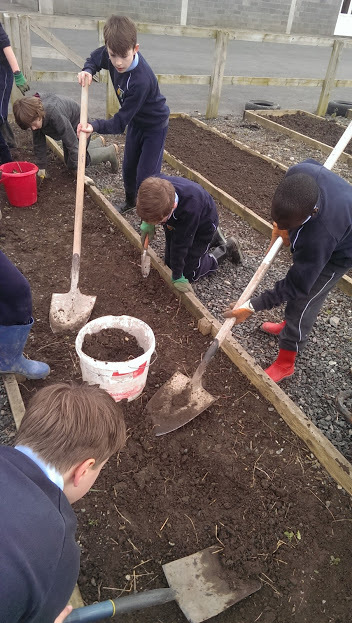 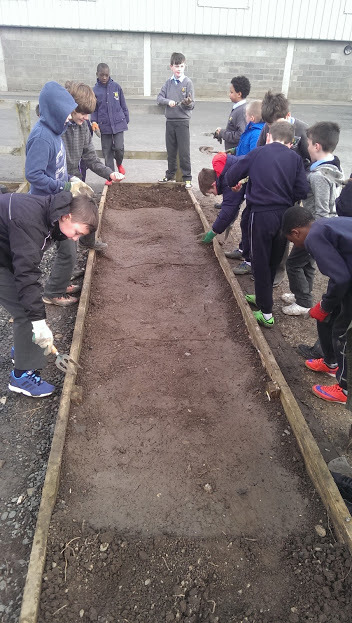 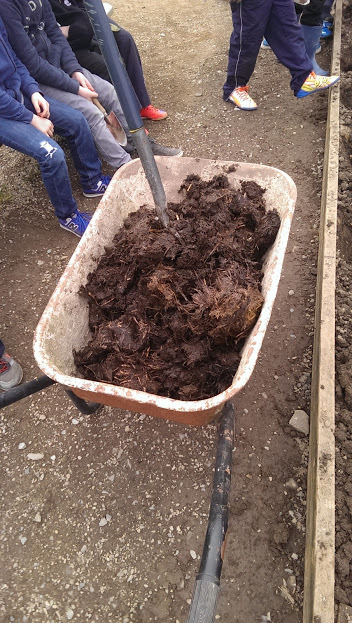 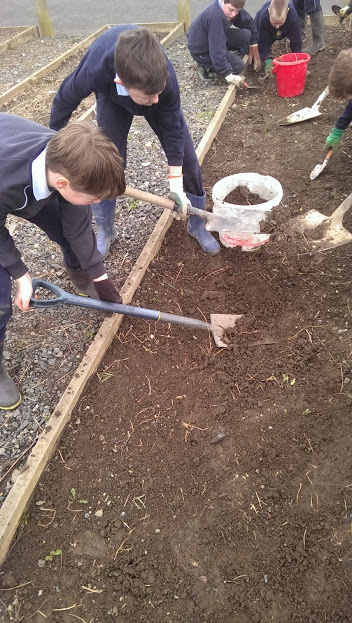 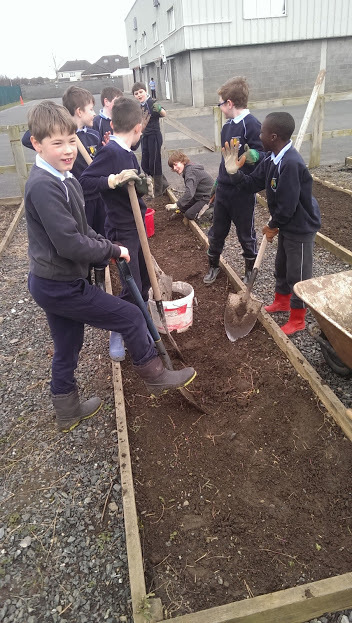 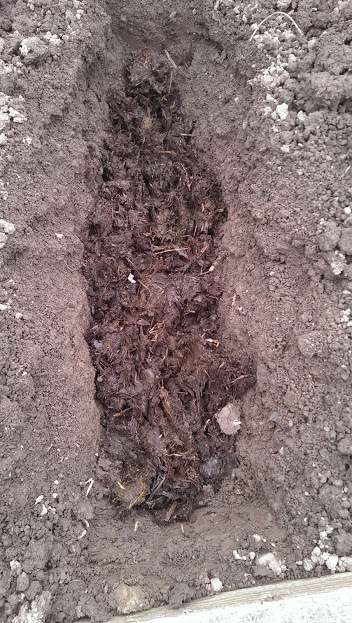 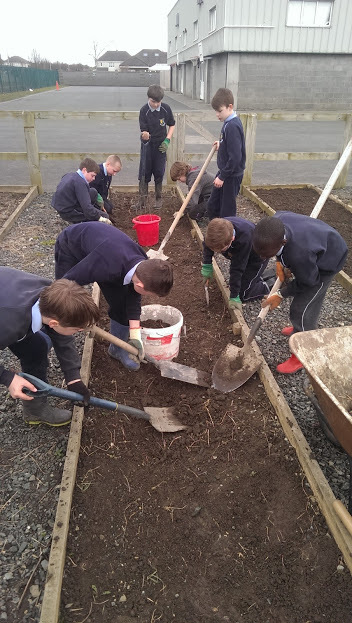 After removing the cover we dug up the soil and added some top soil and compost. 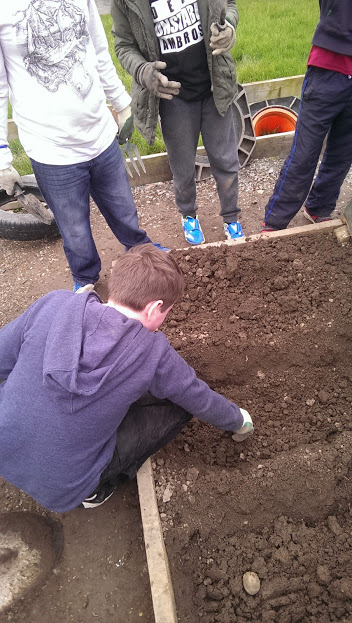 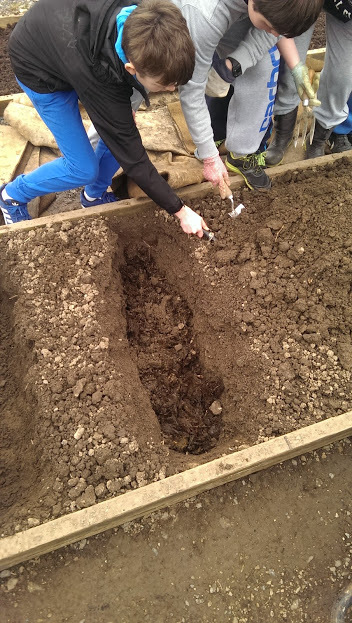 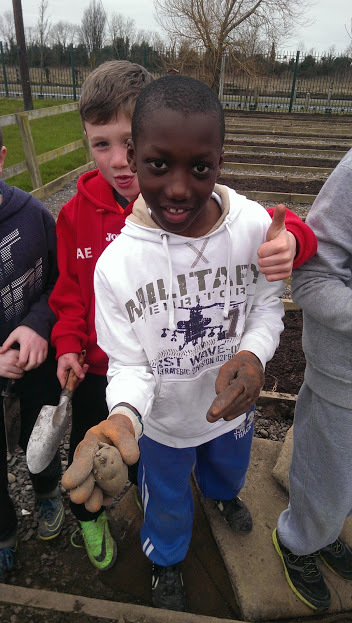 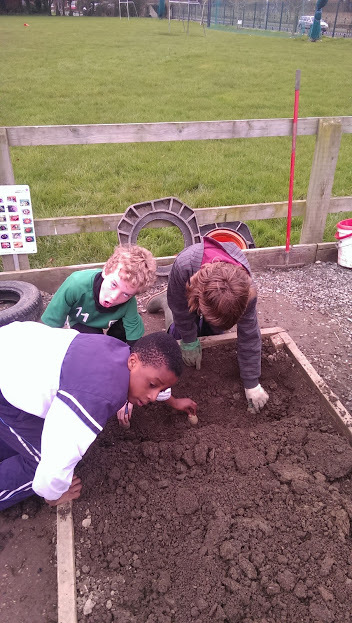 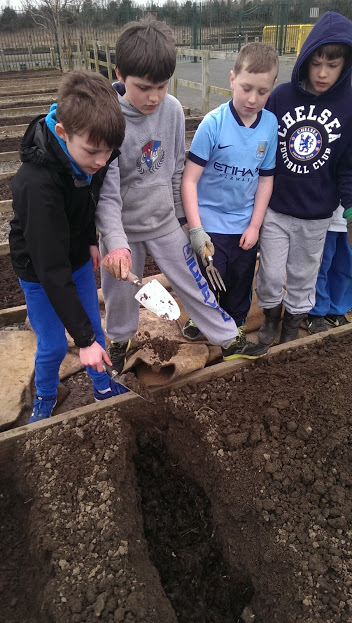 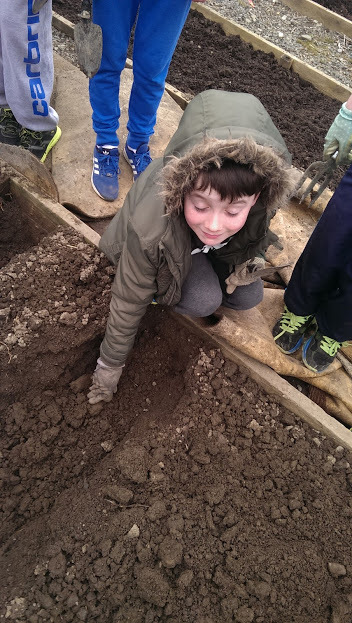 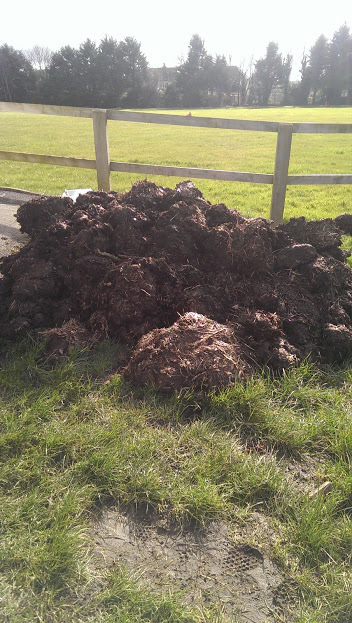 We dug 6 holes and put manure / fertiliser at the bottom of each hole. 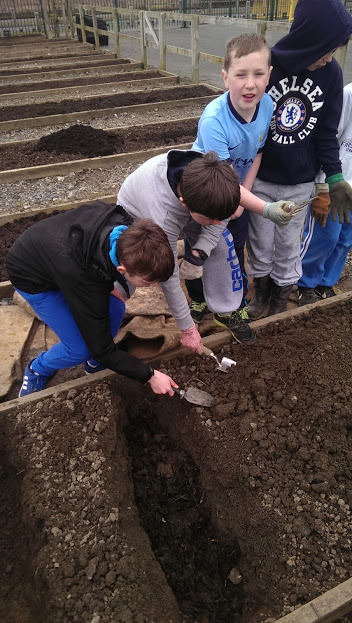 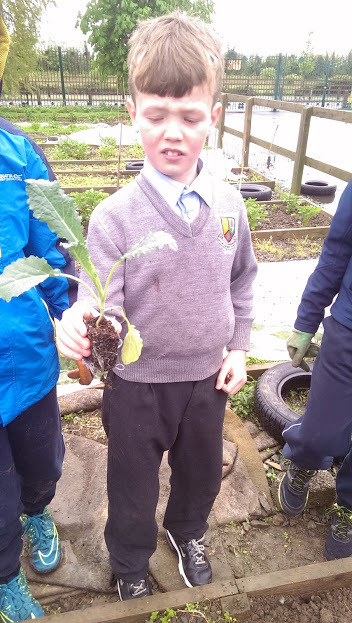 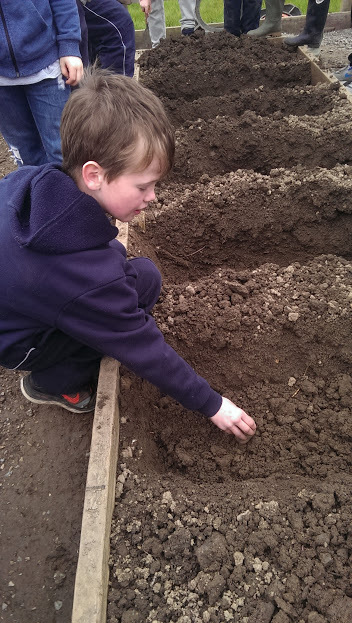 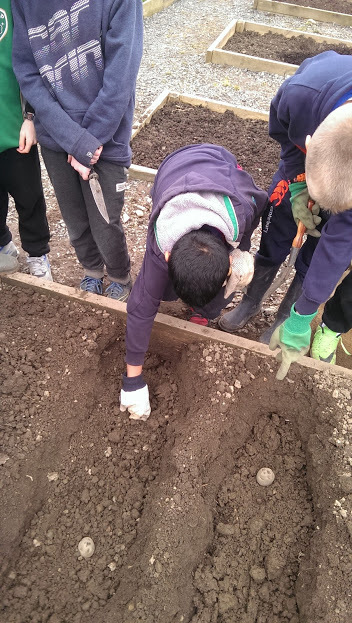 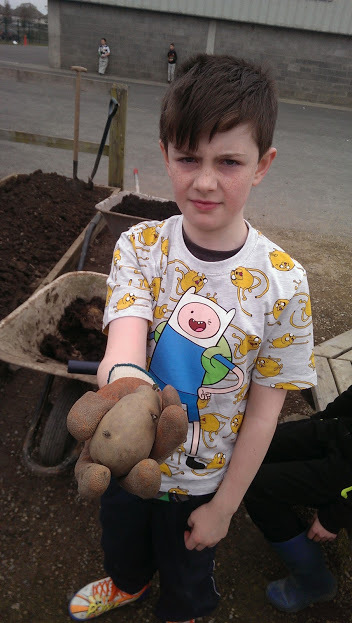 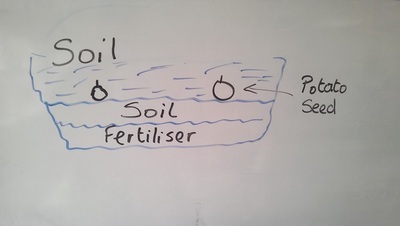 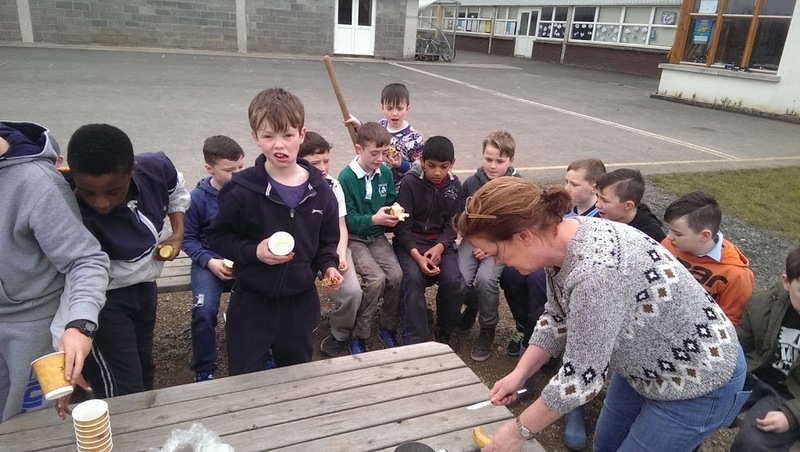 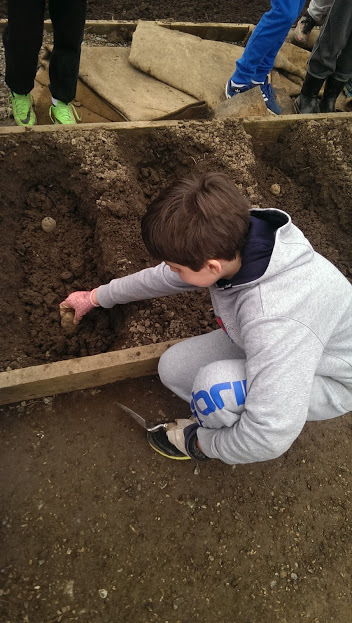 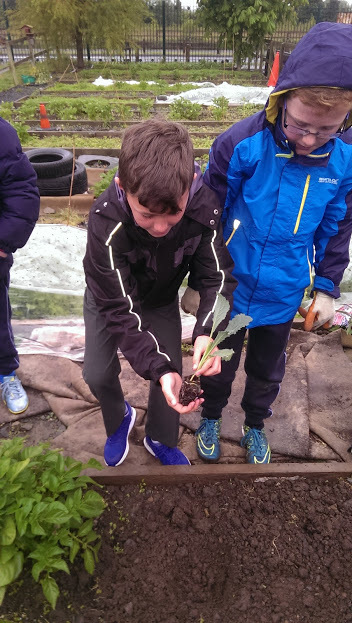 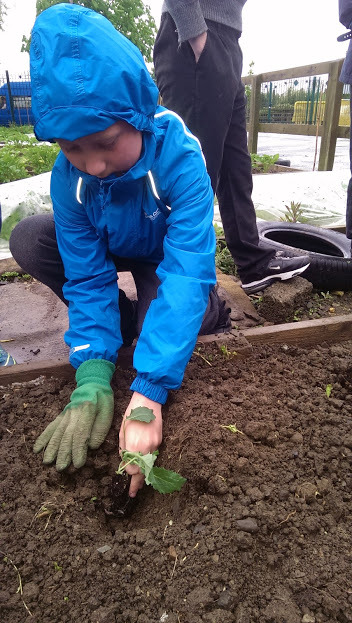 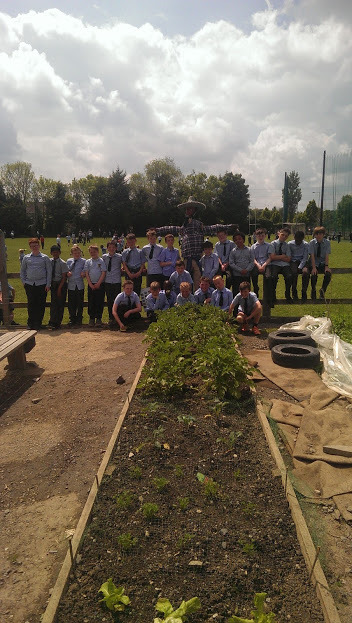 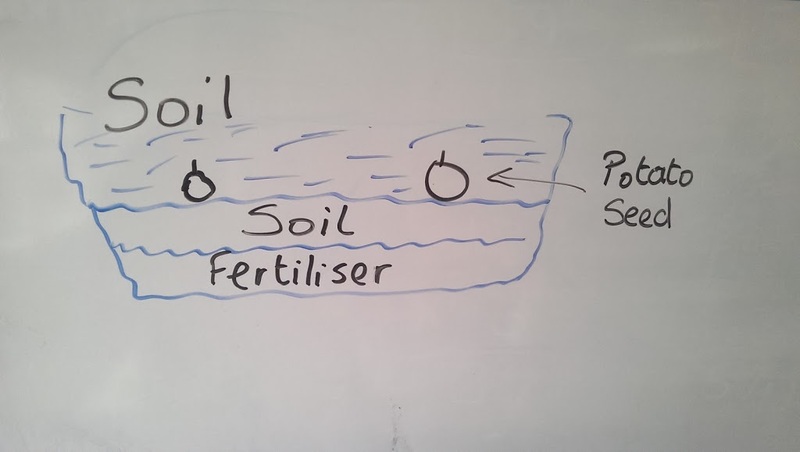 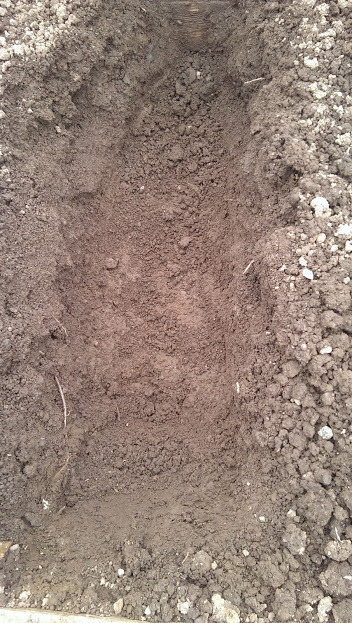 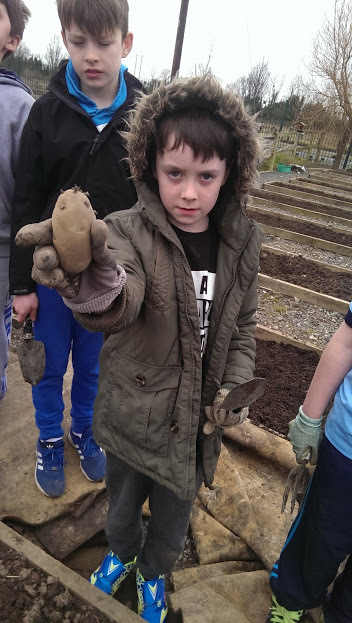 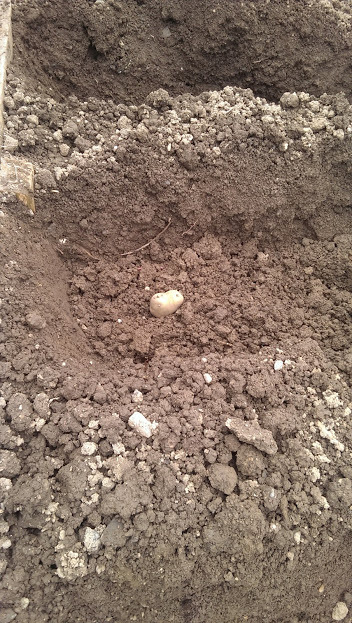 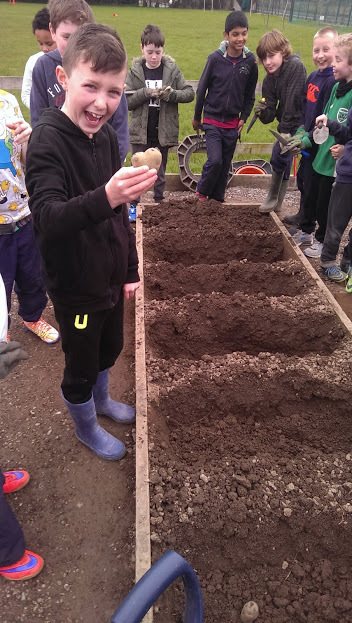 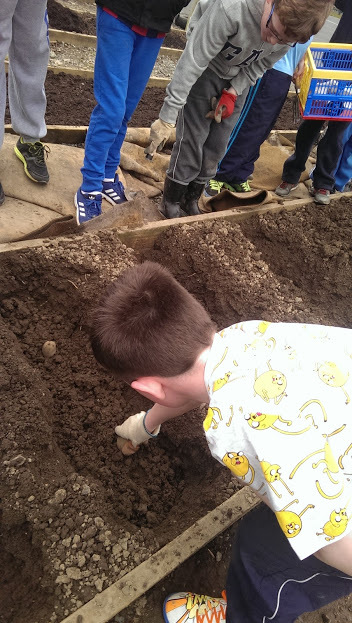 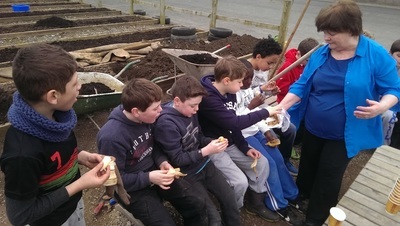 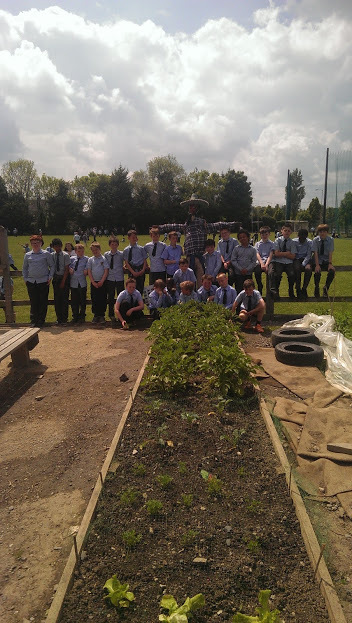 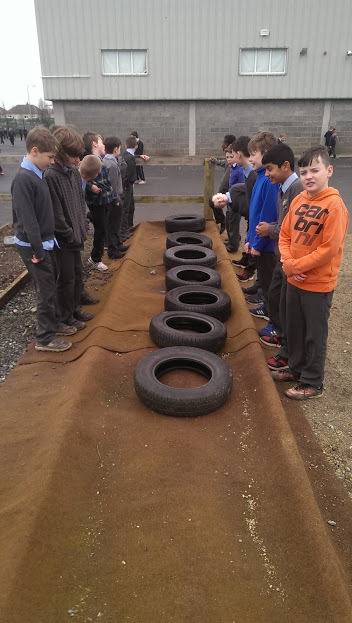 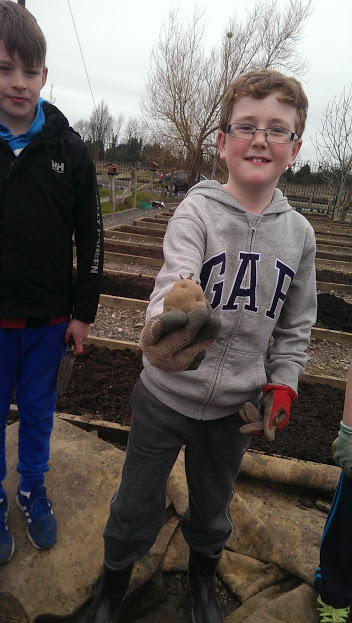 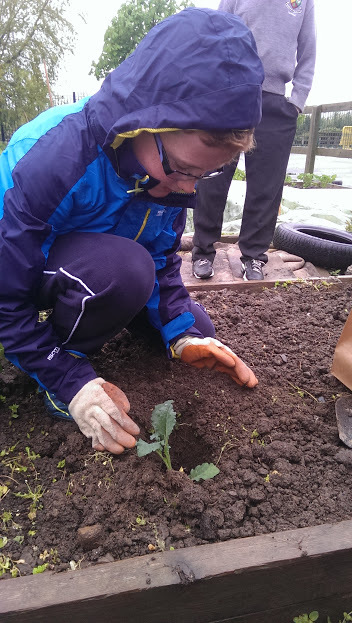 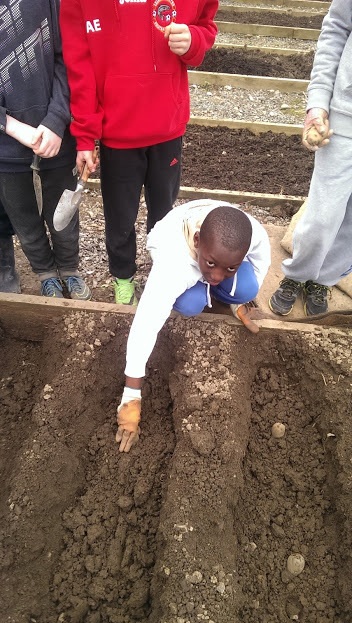 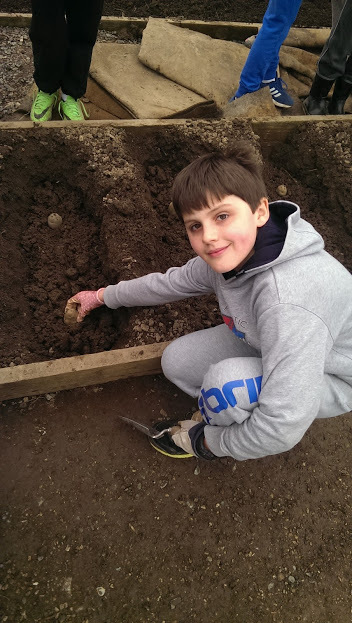 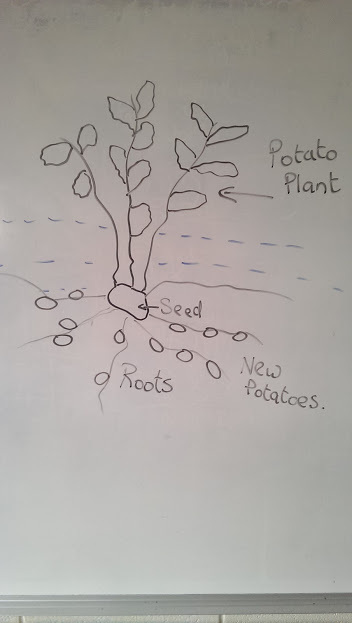 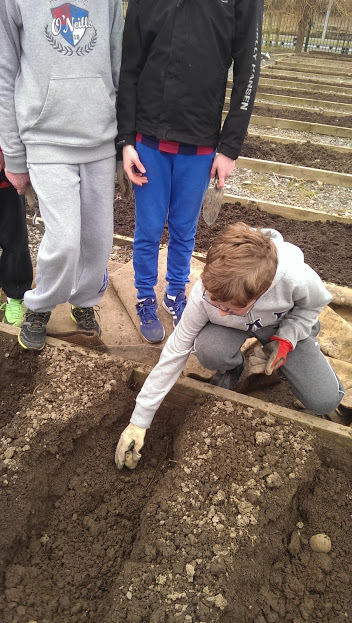 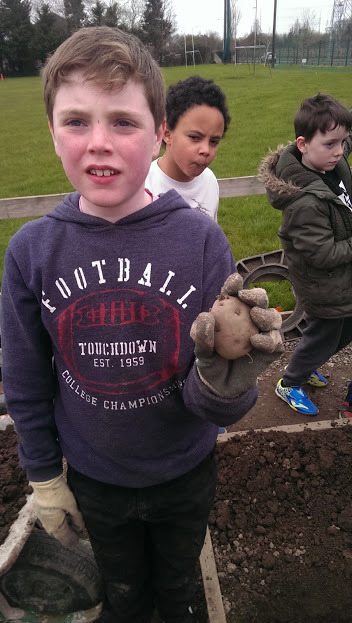 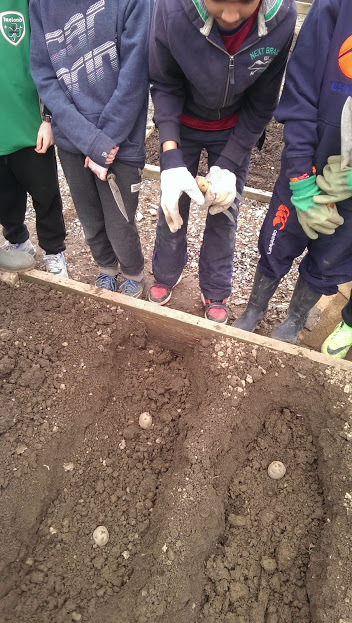 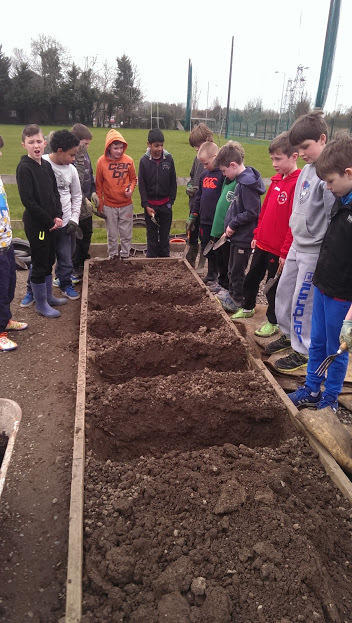 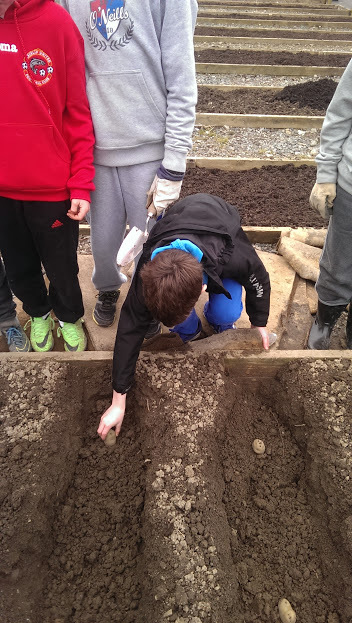 To prevent the potato seed getting burned by the fertiliser we put a layer of soil on top of the fertiliser.Then we planted the potato seeds ,two in each hole and covered them over with the soil. 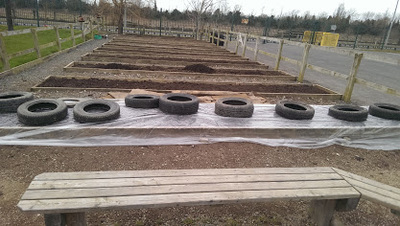 We covered the plot with a plastic sheet. 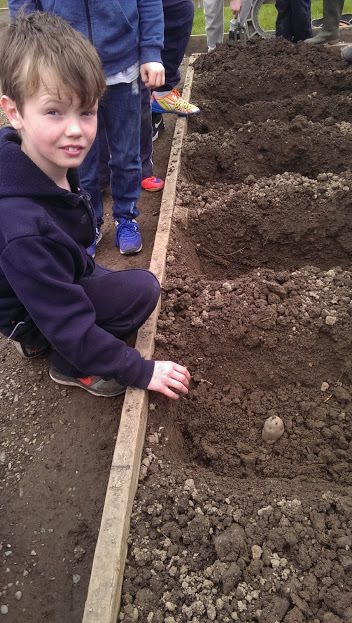 The sheet keeps the frost out but allows light and water throw to help the potatoes grow. ​Last October after weeding our vegetable patch we covered it with old carpet. 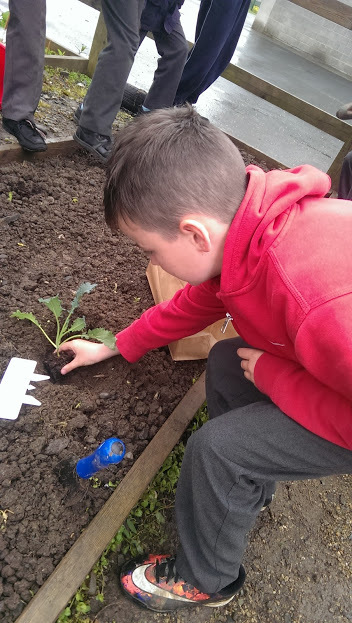 We wanted to see if we could stop weeds from growing by stopping the weeds from getting light. When we took up the carpet in March as you can see from the picture below there were no weeds in the bed. 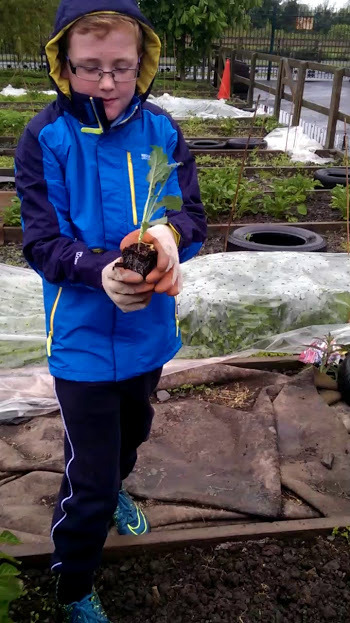 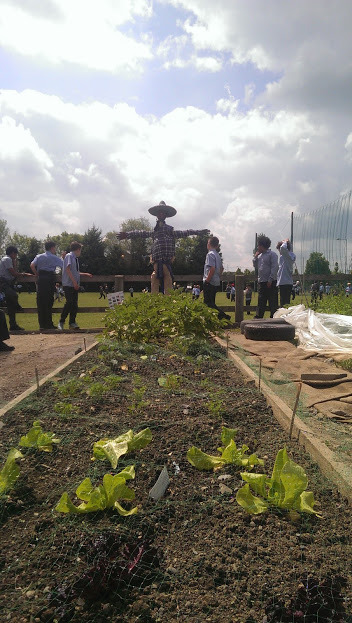 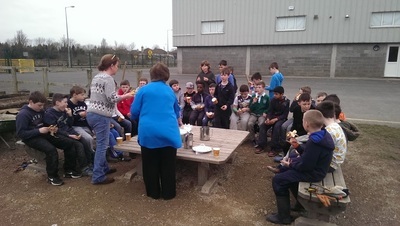 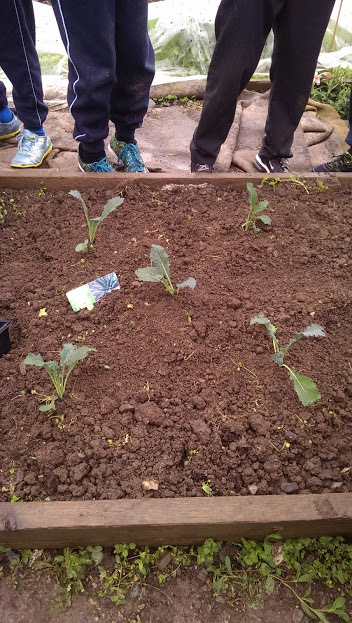 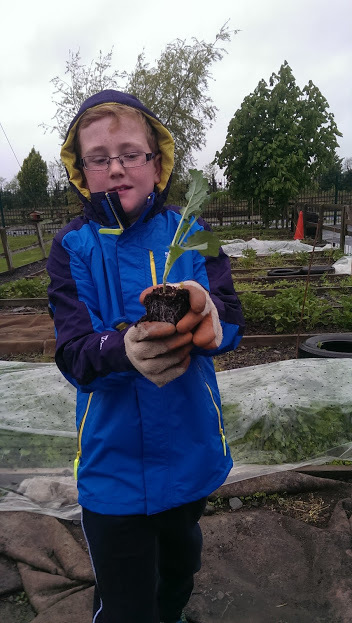 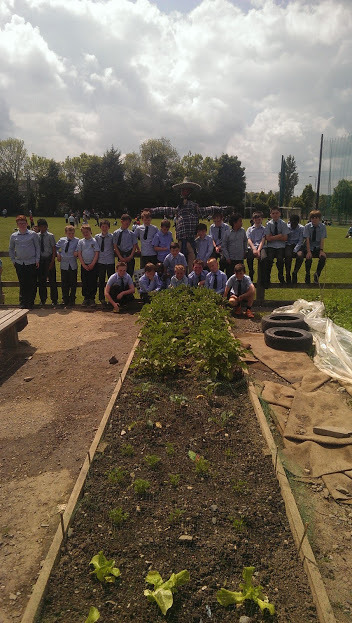 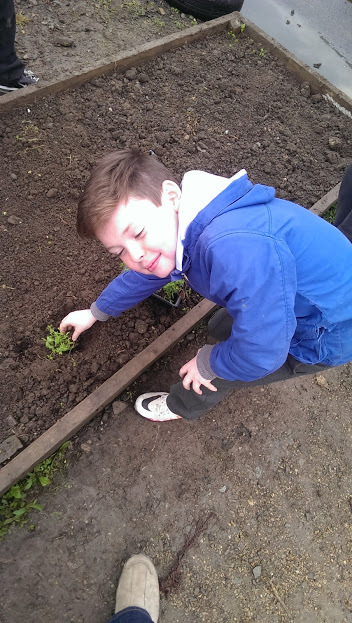 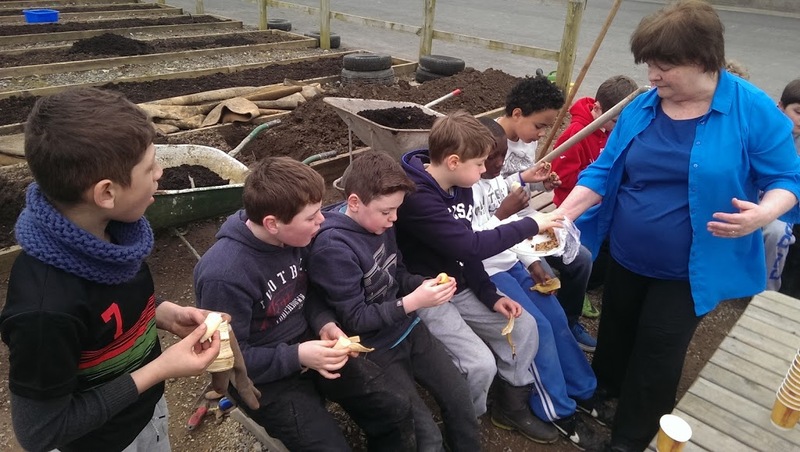 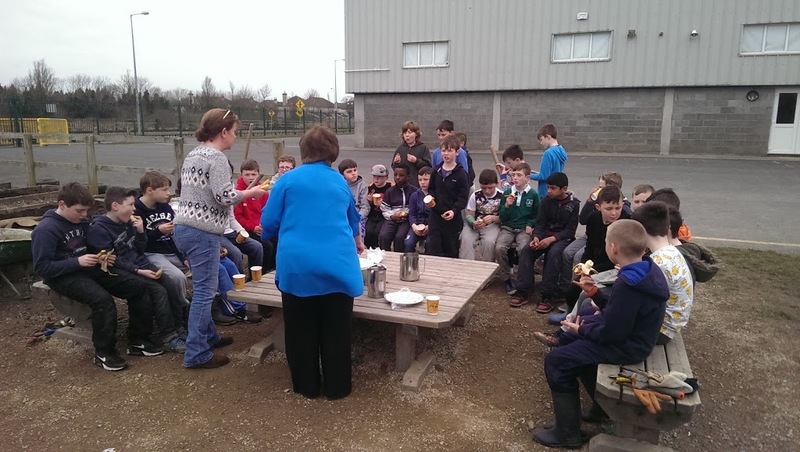 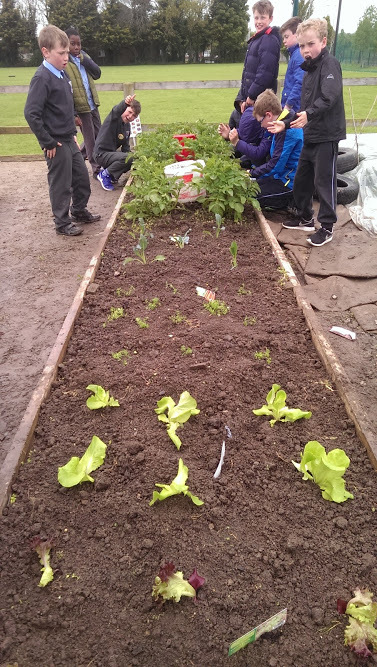 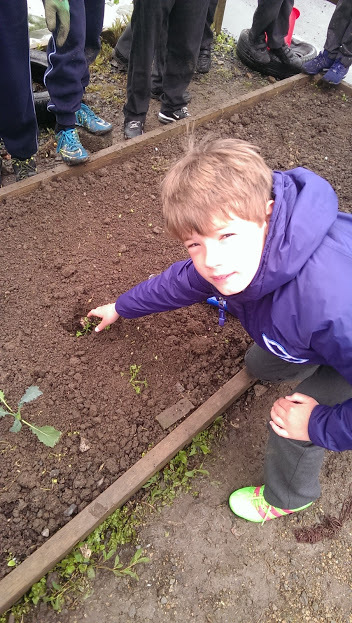 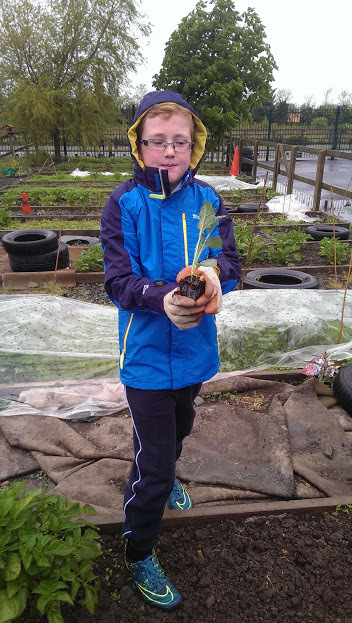 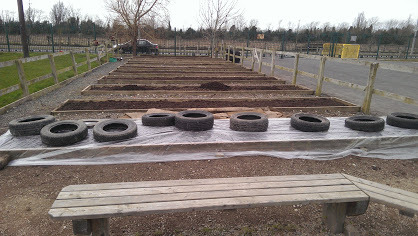 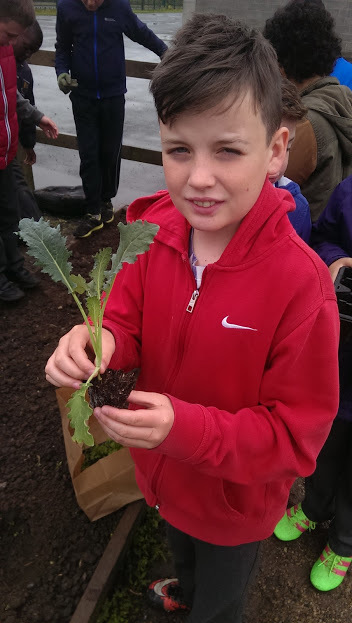 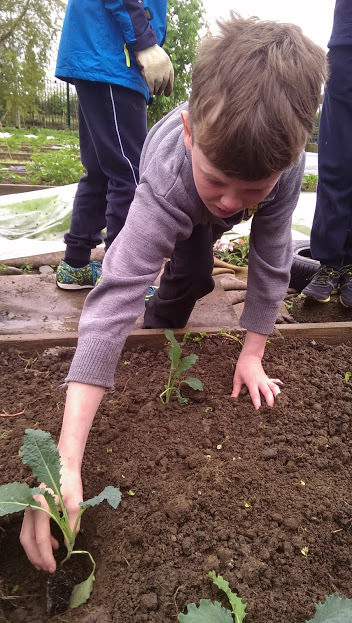 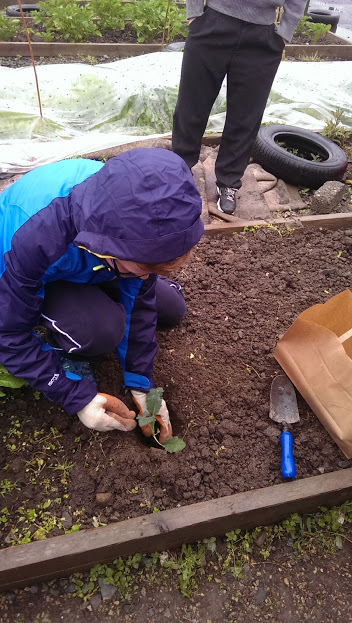 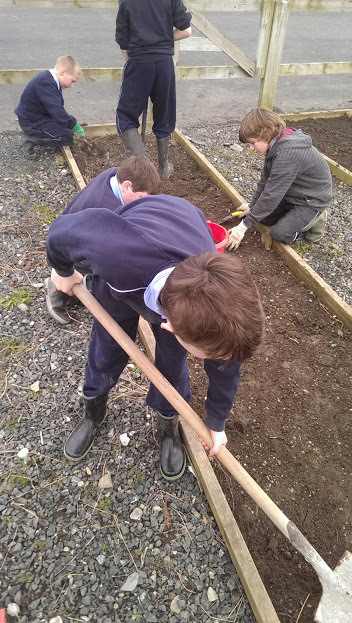 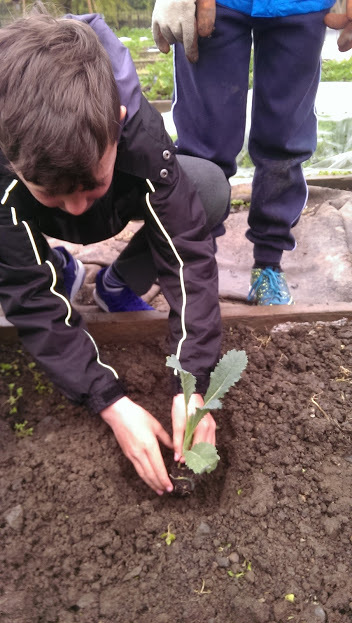 Over the next week we will begin preparations for planting vegetables. 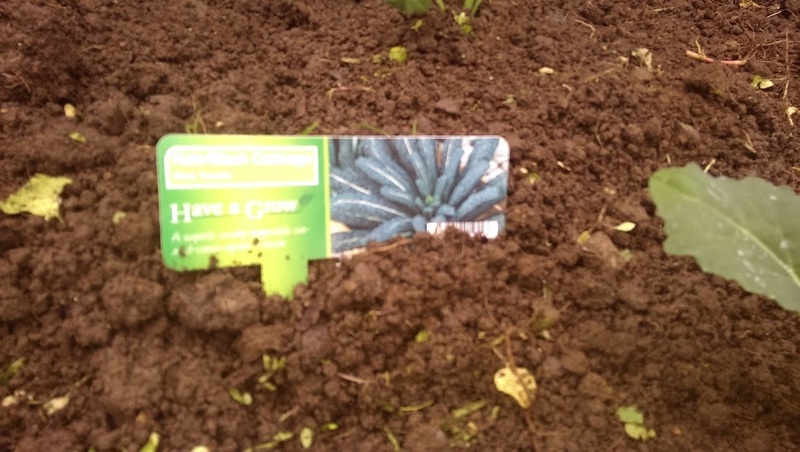 We will definitely sow potatoes and any suggestions for the other vegetables will be welcome.